Fiber optic cables can be easily damaged if they are improperly handled or installed. It is imperative that certain procedures be followed in the handling of these cables to avoid damage and/or limiting their usefulness. The information contained in this article should serve as a guide to proper handling and installing fiber optic cables. Avoid twisting cable Optical fibers require special care during installation to ensure reliable operation. Installation guidelines regarding minimum bend radius, tensile loads, twisting, squeezing, or pinching of cable must be followed. Cable connectors should be protected from contamination and scratching at all times. Violation of any of these parameters causes increased attenuation or permanent damage to the cable. 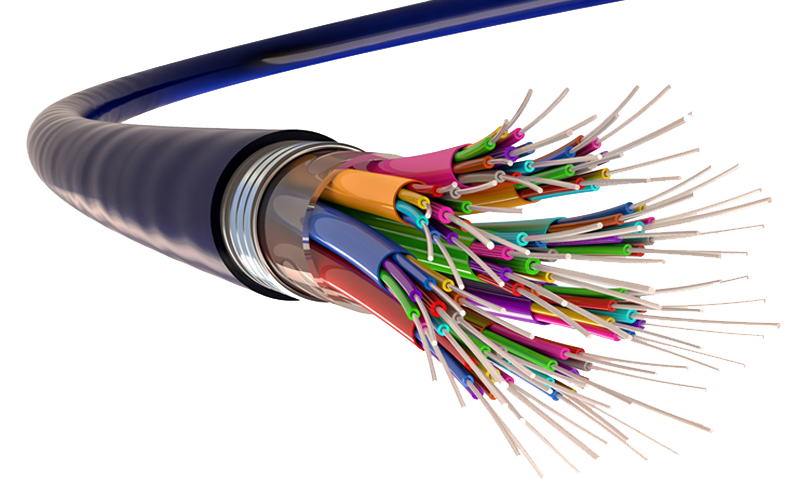 The following are a few general comments to consider when installing fiber optic cables. Make sure you check the installation instructions of the module for the appropriate cable lengths to ensure proper operation. You may experience additional attenuation loss when using bulkhead connectors to join cables even when the total length is less than the maximum. Care should be used in maintaining total attenuation budget when joining cables with bulkhead connectors. Exceeding the bend radius of the cable can cause unseen damage to the fibers of the cables that may not manifest itself for a period of time. This can lead to an expensive restringing of cables at a later date. Use proper pulling techniques in laying out your cable. Putting twists in the cable greatly increases your chances of breaking the fibers. On runs from 40m to 100m, use proper lubricants and make sure they are compatible with the cable jacket. Never pull on the connector. The connector/cable interface is not designed for pulling. Use a pulling grip designed for pre-connected fiber optic cables. Fiber provided by Watchfire Signs includes pulling grips. Grips with a fixed pull ring should use a swivel to attach the pull rope. Monitor tension. Do not exceed the maximum tensile load. If possible, use an automated puller with tension control or at least a breakaway-pulling eye. Always use a straight pull. Use cable guides to maintain the recommended bend radius. Do not exceed the cable bend radius. Exceeding the bend radius harms the fibers. It may not be immediate, it may even take a few years but eventually by exceeding the recommended bend radius of the cable you reduce the useful life of the cable. Putting a twist in the cable can stress the fibers. Cable Conduit Straight Pull is OK. Offset Pull is not recommended. For a 40m or longer pull. If you are installing cable of lengths 40m or longer, use a “figure 8” on the ground to prevent twisting. The figure 8 puts a half twist in on one side of the 8 and takes it out on the other, preventing twists. Lay cable on floor in a figure 8 pattern. Turn Figure 8 cable 180 degrees (upside down) before continuing. Pull in opposite direction (may require two people). Use a swivel-pulling eye, to prevent additional twisting of the cable during installation. Take care to properly route cables through cabinets and right angle raceways. Install cables in raceways without loops. Avoid placing fiber optic cables in raceways and conduits with copper cables to avoid excessive loading or twisting. Protect cables from excessive or frequent bending. Cables do not have a flex rating. Routing on a cabinet door should be used as a last resort. Special care must be taken to protect the cable and to avoid exceeding the bend radius of the cable. Use proper cable pulling techniques when routing cables. See the section Fiber Optic Cable Pulling Techniques earlier in this manual. Attach cables with plastic clamps having large surface areas. Avoid pinching or squeezing cable. Cable clamps should be installed manually with gentle pressure. Proper cleaning of the fiber optic cable ends and transceivers is essential to minimize system attenuation. Dirty fiber optic cables cross contaminate their mating transceivers. Conversely a dirty transceiver contaminates its mating fiber optic cable. There are a variety of ways to clean fiber optic components. Readily available prepackaged wipes, swabs and, canned air are suitable. Always choose an optical grade cleaner for these purposes. Use a wet wipe to loosen particles on the end of the cable connector using a circular or straight wiping motion while using care to avoid wiping over area of pad that has already been used. Do not use a back and forth scrubbing action. Always use a clean area of the swab for each connector. When in doubt use a fresh wipe. Follow up the wet wipe cleaning with a dry wipe to remove any residue. Use canned air to remove any lint from the cable end. Choose an optical grade lint free swab that fits easily into the transceiver barrel. Under some conditions a fast evaporating optical cleaning solvent may be used to saturate the swab (e.g., 99% pure alcohol). The swab should be gently placed into the barrel of the connector and rotate no more than one turn. DO NOT rotate back-and-forth or round-and-round because this could grind debris into the transceiver. The swabs should only be used ONCE. Use a dry clean swab and insert into barrel and rotate once. Discard swab. Use canned air to blow out the barrel. What are the specifications of the fiber-optic cables Time-O-Matic ships with an LED sign? Plenum rated. Approved to be placed in plenum spaces of buildings. OFNP listed. NOTE: Multi-mode fiber is typically used to send data over short distances (up to 600 m or 0.37 miles), as the wavelength of the source LED is 850 nm (nanometers). Single-mode fiber is typically used to send data over long distances, as the wavelength of the source LED is 1310 or 1550 nm. NOTE: Watchfire Signs used to ship single fiber-optic cable. Those specifications were identical to the new specifications, except for pulling strength; pulling strength was rated at 100 pounds. The smaller size of a single cable allowed the fiber to be placed in smaller diameter conduit. The fiber-optic cable should be installed in 1 1/2″ or larger PVC or EMT conduit. The fiber-optic cable must be placed in weatherproof conduit for its entire life-span. Exposure to sunlight will bleach the fiber and cause loss of communication. According to Article 770 of the National Electric Code, our fiber-optic cable can be buried in the same conduit as power lines. Local codes may take precedence over the NEC. Use caution when pulling the fiber through conduit containing large power wires. Cleaning ST connectors: Use alcohol and a lint free cloth to clean the ST connectors. Do not leave fingerprints on the glass fiber. Watchfire Signs offers fiber-optic cables in various lengths up to 1000 feet. When using lengths over 1000 feet, Watchfire Signs recommends using a coupler box junction box. The two fiber cables would be joined using a female-female coupler and secured inside the junction box. Note: Each coupler box degrades the signal. Do not remove the pulling eye prior to installing fiber, this could cause damage to the fiber and connectors. Do not fold or kink the fiber, this can cause the fiber to break.